For a week in June the academy hosted a wonderful group of young musicians from Chetham’s School of Music. 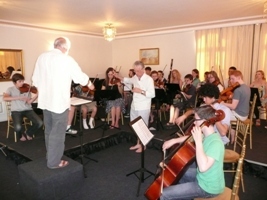 The group comprised a string quartet and wind quintet, led by three members of the teaching faculty including Director of Music Stephen Threlfall. The first event to take place was a Primary Schools Concert at the Jersey Arts Centre, coordinated by the Jersey Instrumental Music Service. Around 200 children attended this concert, which involved singing and dancing, and a memorable moment where children were invited onto the stage to sit and stand alongside the string quartet to follow their music through the performance of Shostakovich’s 6th String Quartet. 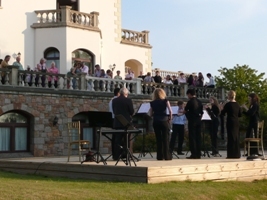 That evening, the group performed their full recital at the Jersey Arts Centre, which was well attended in particular by groups of local young musicians and their families. A wonderful variety of solo performances and ensemble works displayed the expressive and virtuosic qualities of all the different instruments on display. The following day the group spent a full morning at Victoria College Preparatory School, firstly performing to the whole school, and then working alongside a group of children who had spent the term writing compositions to play alongside the Chethams students. That evening the Chetham’s students were joined by a large group of local young musicians to create a chamber orchestra, rehearsing Britten’s Soirees Musicales and Mozart’s Piano Concerto no. 12, with local soloist Georgina Sutton. On the Saturday thee group met up at Durrell with all the VCP students to perform the ‘Concert in the Courtyard’. In the beautiful setting of Augres Manor’s courtyard, each of the VCP schoolchildren performed their own compositions alongside the visiting students, in front of an audience of families and holidaymakers. The evening was once again spent rehearsing the chamber orchestra. On the final day of the tour, rehearsals in the daytime led up to the ‘Chethams and Friends’ concert at the academy, in which the chamber orchestra performed in front of a packed audience, alongside ensemble performances given by the visiting students. The tour received the support of the Jersey Arts Trust, and by all accounts was a huge success and highly inspirational and motivating for all the local young musicians and schoolchildren involved. Plans are already in motion for next year!